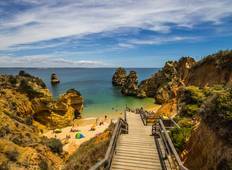 Find a Discovery trip that explores Portugal. There are 77 tours to choose from, that range in length from 4 days up to 32 days. The most popular month for these tours is May, which has the most tour departures. "Absolutely fantastic. Best experience I ever had. Couldn't be more happy about it"
"Everything was planned perfectly with our skill level and interests in mind. Luke..."
"Evening at the manor house as an option was terrible. Awful food, rude service. Terrible..."
"As our first tour with Globus we were impressed. We will certainly be back if the..."
"First coach trip I ever did and it was excellent. Brand new coach, and our driver..."
"Guide was unexciting good admin skills. Group was terrific. Itinerery quite good...."